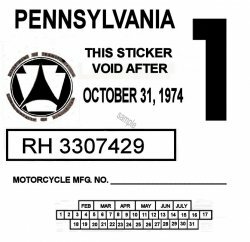 Pennsylvania 1974 Cycle Inspection sticker - $20.00 : Bob Hoyts Classic Inspection Stickers, Add a Final Touch to your Restoration! This is a 1974 PA Inspection sticker (MOTORCYCLE) This reproduction has been carefully restored and reproduced front and back directly from an original. It is identical to the passenger sticker except it is smaller. It has our patented double "Peel and Stick" format that allows you to attach it to either outside or inside a window. It was printed with a high grade Laser printer which combined with the double sided vinyl backing makes it virtually water proof. For an additional $10.00 your license plate number can be added to this sticker where the serial number now exists.